Snow is falling, the scent of pine needles is in the air, so it must be… Time to watch some awesome movies and TV shows on COMET TV and CHARGE. 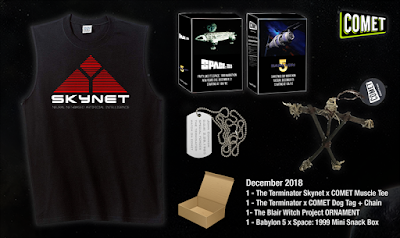 This December the sci-fi and horror classic "The Terminator" is blasting its way through Comet TV. Check out the classic and the birth of Cyberdyne Systems. If that wasn’t enough to celebrate the holiday season Babylon 5 has a Christmas marathon. After sipping on egg nog and trimming the tree, COMET TV has a spacey Christmas Marathon, starting at 10 a.m./9 C! Don’t forget to check out Area 10. The best in cult classic films are airing all month long on Comet TV! 1 – Exclusive Blair Witch Holiday Ornament – Deck the halls and ring in the new year with the Blair Witch! This hand-crafted ornament will bring holiday scares to you and those you love. To enter you must be subscribed to my YouTube channel: Thisfunktional and follow instagram.com/Thisfunktional and email me your full name and mailing address with the subject line #ThisfunktionalContest #CometDecemberGiveaway to Thisfunktional@Gmail.com. Disclaimer: Winners will be chosen randomly. Contest runs to January 01. 2019 at noon. No purchase necessary. Prize provided by H+M Communications. Only open to the U.S., no PO Boxes or international addresses. Only one entry per household. Entries on behalf of another person will not be accepted and joint submissions are not allowed. We will not accept entries of contestants who have claimed a prize in the last 6 months.